Do You Know How Much Your Work Matters to God? They each bring with them their own exhaustion and exasperation, their own uncertainty about how their work matters to God. Good news: All work matters to God because all work reflects some aspect of his character. He created the world so that it runs best when it mirrors him, and you will find the most fulfillment when you recognize God behind your labor. John Van Sloten leads an innovative investigation of vocation. 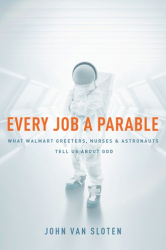 It's a fascinating journey that illuminates how your work is a parable of God - as you work, you are an icon of grace. Here are stories of regular people who are discovering the bubbling ferment of God's Kingdom in their callings and vocations. Read this and be encouraged that the Spirit really is out ahead of us in our work lives and callings. - Alan Roxburgh, President of The Missional Network. Filled with startling insights and fascinating characters, Van Sloten's book will help you see that what you do Monday through Friday truly is a sacred calling, one in which God wants to speak to you and to the rest of the world. - Drew Dyck, Senior editor of CTPastors.com and author of Yawning at Tigers.